It's probable that a good number of the most-followed users on Quora have disabled or filtered many of the notifications from the site, including new followers and replies to posted content. With the site activity spiking in the last 60 days or so, follower notifications were fast and furious into the in box. Today, Quora appears to have reduced their tax on both users' in box and on their servers, in terms of delivering the messages, by capping the update at a single roundup per day. Minor update you say? Not worth a blog post? Fine. Skip this one. But it's a trend I'd like to see other services adopt or offer as an option. 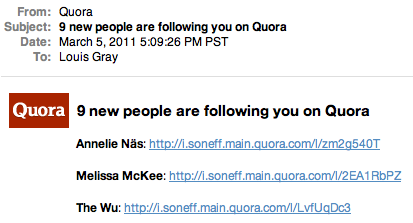 For me, after 3,000 or so follower notifications on Quora, it was nice to have absolutely zero updates between the morning of March 4th, and the wrap-up in the evening of March 5th. Now, if I get a minute or two, I can scan the incoming message for interesting people and dedicate time to this, rather than multiple interruptions per day. If you've previously turned off notifications from Quora, or want to tweak the settings you have now, they've got extremely granular options you can access on your settings page. And if you want to be added to my following list in tomorrow's message, we can get connected here: http://www.quora.com/Louis-Gray.